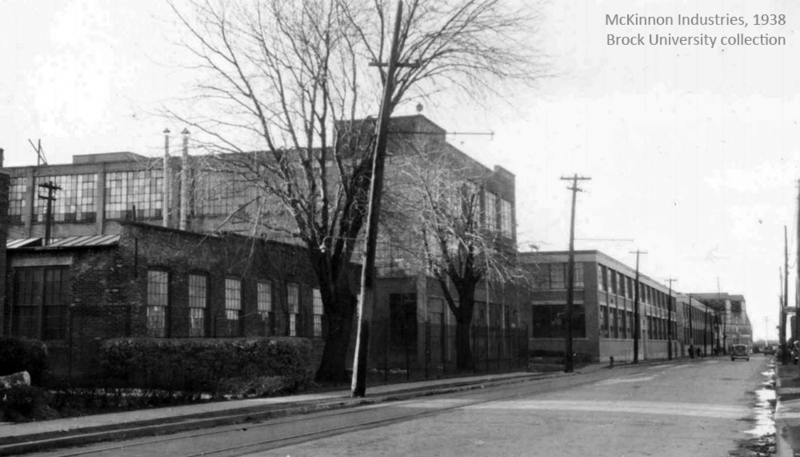 Thanks to posters on The Vintage St. Catharines group on Facebook, I now have two period views of McKinnon Industries on Ontario Street in St. Catharines. This is one of the places on the Niagara St. Catharines & Toronto Railway that speaks most strongly to me, as I spent my high school years living near the plant and encountering the CNR switch job that served it on an almost daily basis. 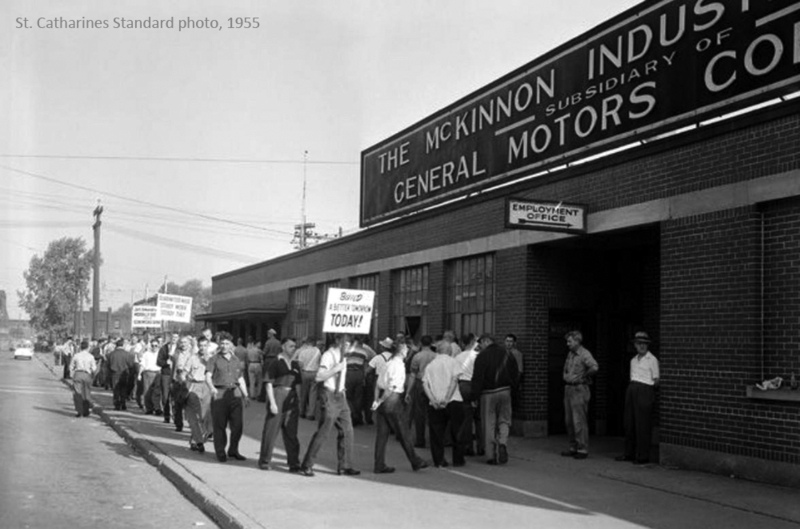 This image was shot for The St. Catharines Standard newspaper during a major strike by General Motors employees in 1955. The building is on the east side of Ontario Street, and the photographer is looking roughly north: The foundry on the west side of Ontario at Carleton Street can be seen on the left edge of the photo in the distance. According to several online sources, the union called this strike over frustration with the pace at which General Motors was implementing the terms of a five-year agreement negotiated in 1950. It was a long strike – lasting five months and involving 17,000 GM employees at several plants in southern Ontario. At the end, the workers received what they sought: A pay raise, more secure working conditions, and a health plan. For me, this photo answers a couple of important questions. First, I know that I won’t be modelling this particular era – I’m sure the NS&T did not make any deliveries to GM on Ontario Street while a strike was going on. More importantly, though, I know that while GM acquired McKinnon Industries in 1929, the McKinnon name remained in use through the mid-1950s. I love this sign, because on a layout it would tell everybody, immediately, what they’re looking at. This one, from the Brock University collection, looks north up Ontario Street and shows the facilities on the west side of the street, including the foundry in the distance. What I like about this one is it clearly shows the location of the track along the west side of the street (in the 1980s when I saw this area first-hand, it had been relocated to the middle), plus the pole line that carries municipal power, power for the NS&T, and lighting for the sidewalk. It’s worth comparing this image to others that I’ve shared on this website in a post called “The Magic of McKinnon on Ontario. 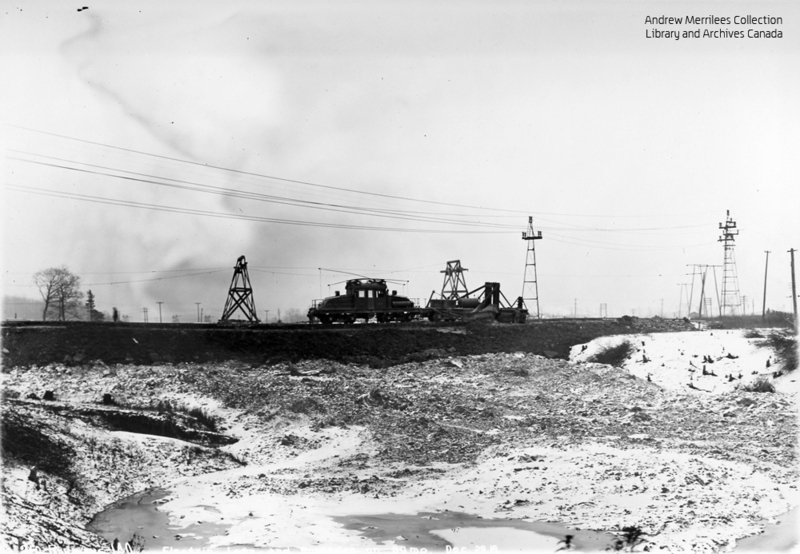 While working my way through photographs of the Niagara St. Catharines & Toronto Railway from the Andrew Merrilees Collection at Library and Archives Canada in September, I found a number of images from the Queenston Power Canal Construction Railway – operated by Ontario’s Hydro-Electric Power Commission. 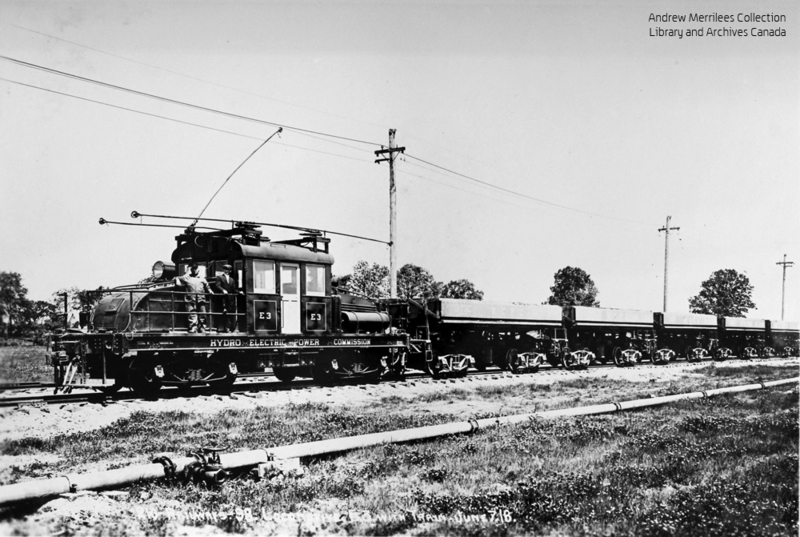 As noted previously, this railway was a electric line that once operated in the Niagara Region – and which supplied a few freight motors to the Niagara St. Catharines and Toronto Railway. One of these motors was E21. The HEPC acquired this Baldwin-Westinghouse 55-ton freight motor second-hand in 1919 from the Auburn & Syracuse Railway in New York State. It went to the Toronto & York Railway as its #2 in 1924 before ended up back in the Niagara Region in 1927, as the NS&T 18. 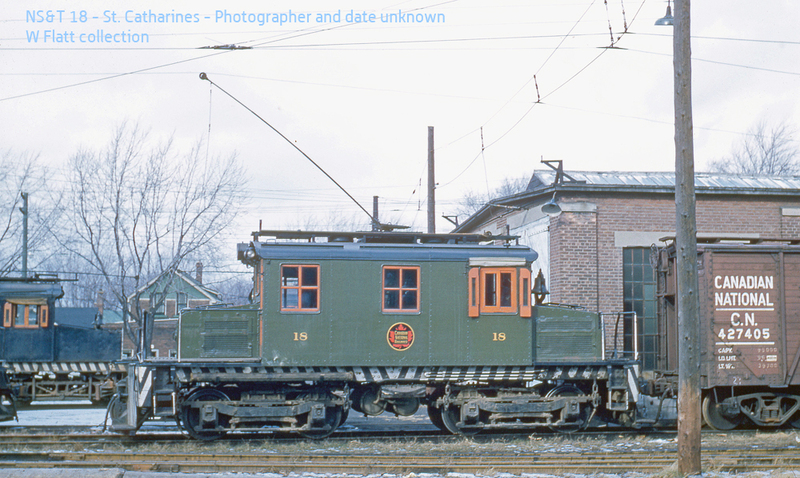 When the wire came down in 1960, the CNR forwarded this freight motor to the Oshawa Railway as its #18. 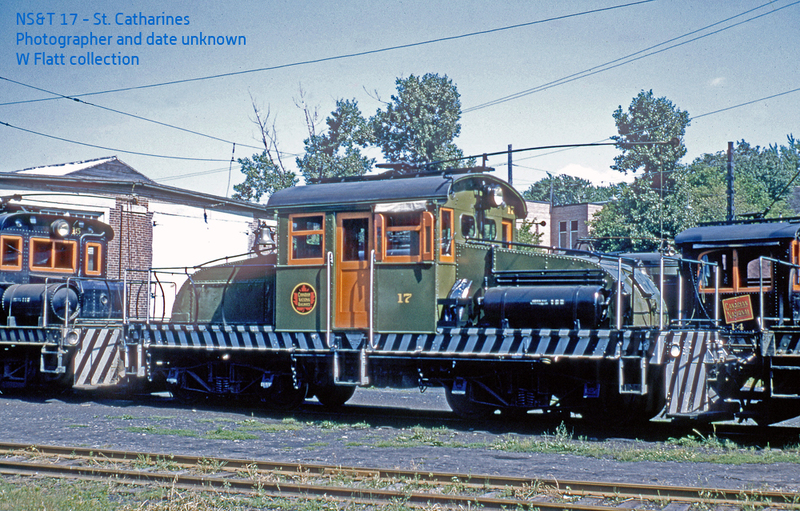 This freight motor was fortunate enough to go into preservation, when it was sold to an enthusiast and ended up at the Connecticut Trolley Museum in 1964. It’s still there today. With this post, I think I have exhausted my material on the HEPC Queenston Power Canal Construction Railway. (If you missed any posts, you can find them all using the HEPC – Construction Railway category link.) 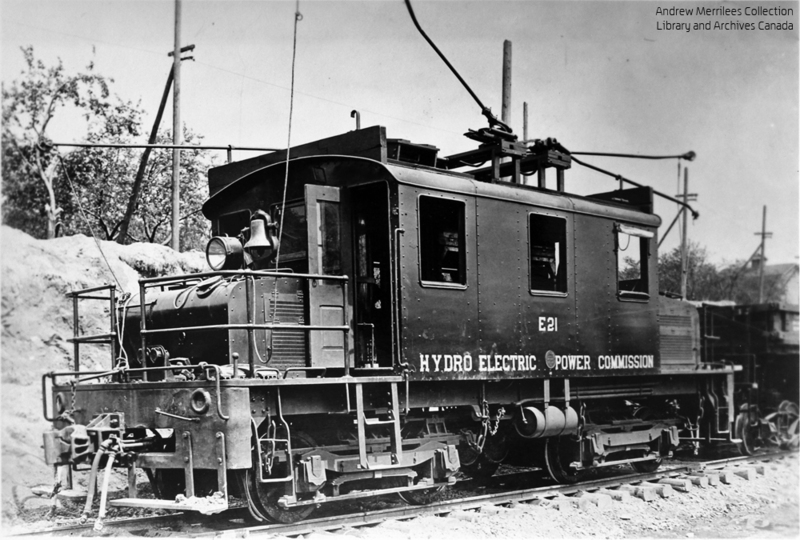 I hope you’ve enjoyed this look at this short-lived yet interesting electrified construction railway in Ontario’s Niagara Peninsula. As noted previously, this railway was an interesting electric line that once operated in the Niagara Region. The railway’s primary purpose was to remove and dispose of material as shovels dug the power canal. As such, dump cars dominated the line’s roster – and I wrote about those in an earlier post in this series. 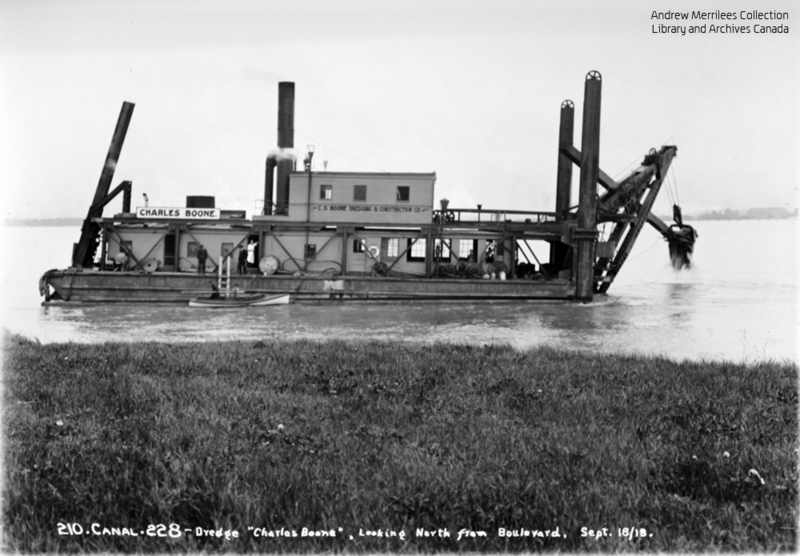 But other industrial equipment was needed too – including this steam crane, #6. The crane is coupled to an unidentified HEPC steam locomotive. While the HEPC used many electric freight motors, it did have steam engines on the roster too, although I don’t have any information about those. I do not know the disposition of this crane – other than that it did not make it onto the NS&T roster. I have more photos of HEPC equipment with their valuations, and will share them in the coming days. As noted previously, this railway was an interesting electric line that once operated in the Niagara Region – and which supplied a few freight motors to the Niagara St. Catharines and Toronto Railway. 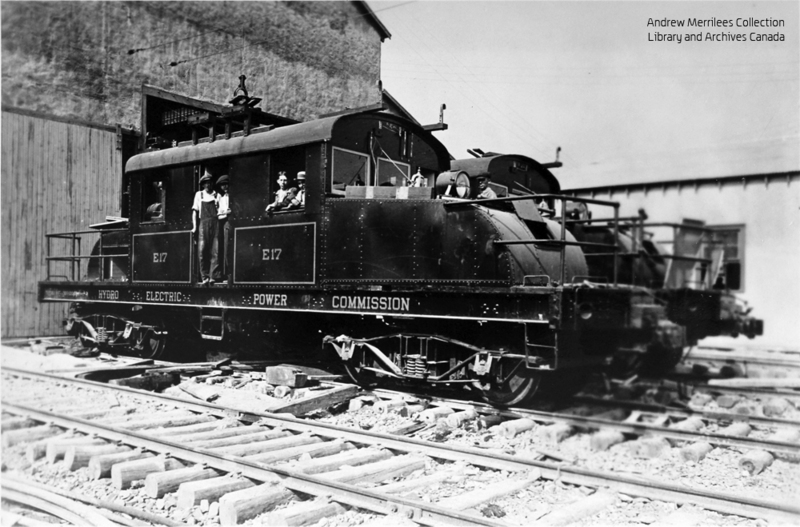 The NS&T rostered two freight motors – the second #16, and the #17 – that were originally built by National Steel Car Company of Hamilton for the Queenston power canal project. 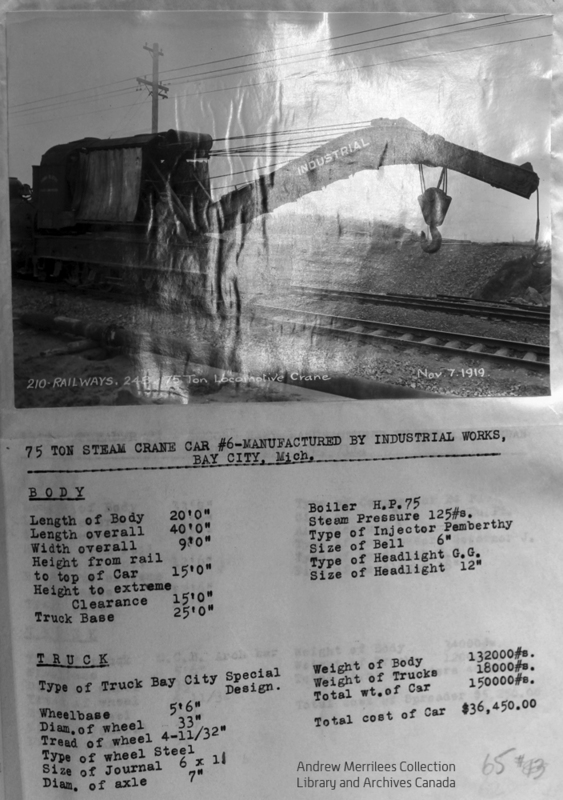 Another HEPC freight motor became the NS&T’s second #16 – although we don’t know which locomotive it was on the HEPC roster. The second 16 arrived on the NS&T in 1926 and received a new cab in 1930. 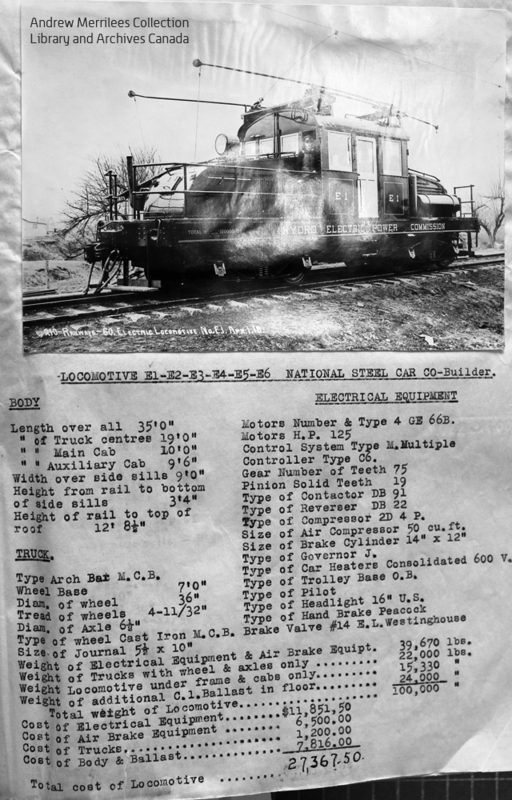 The revised John Mills book on the NS&T notes that the second 16 was a National Steel Car Company product, which would make it one of the E1 to E12 series. Of this series, we’ve accounted for E9 (which became NS&T 17). 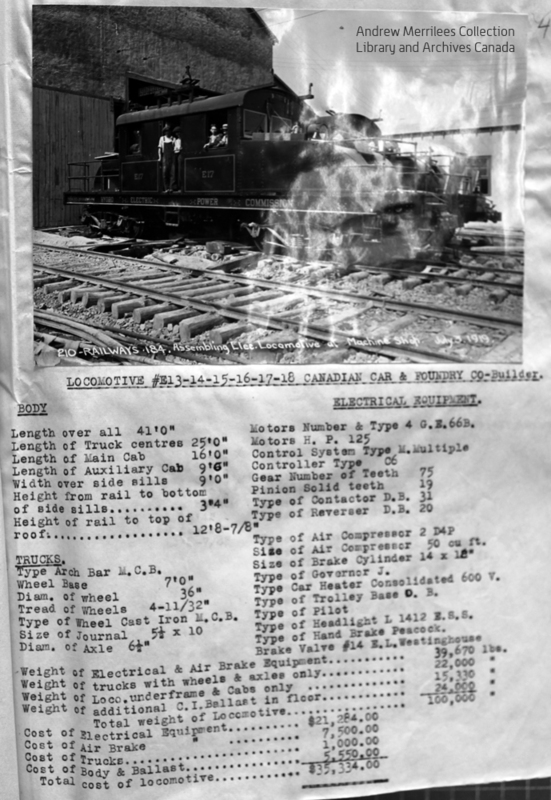 Mills notes E7, E11 and E12 ended up on the International Nickel Company (INCO) railway in Sudbury. I have no information about the disposition of the rest (E1-E6, E8, and E10). As noted previously, this railway was an interesting electric line that once operated in the Niagara Region. 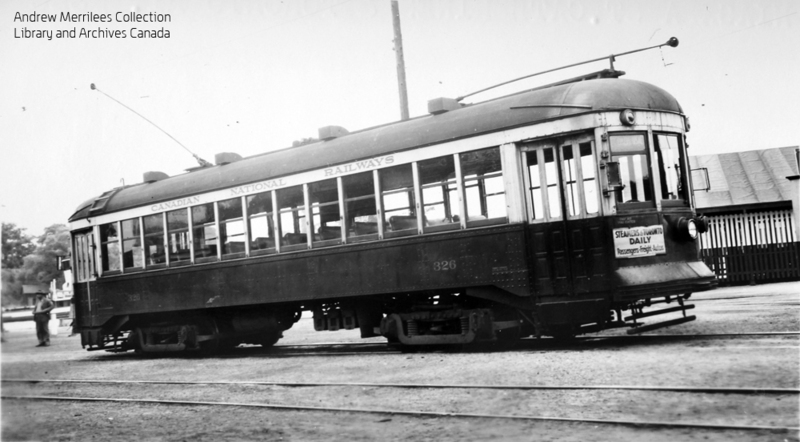 Among the HEPC’s roster were a half-dozen motors – E13 to E18 – built in 1919 by Canadian Car & Foundry of Montreal. None of these made it to the NS&T roster: According to the revised John Mills book on the NS&T, E13 to E17 were among the HEPC motors sold in 1926 to the International Nickel Company (INCO) in Sudbury. I have not found any information about the disposition of E18. 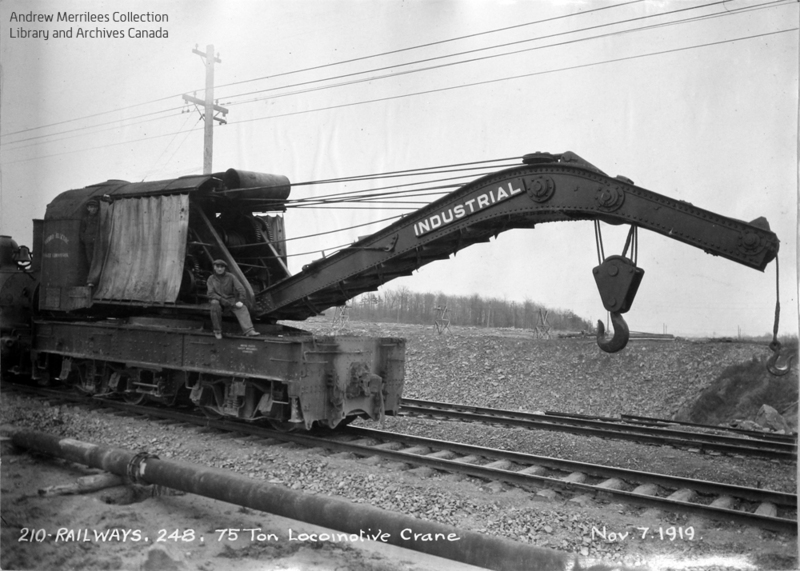 The railway’s primary purpose was to remove and dispose of material as shovels dug the power canal. As such, dump cars dominated the line’s roster. Chapter 18 of the revised John Mills book on the NS&T notes that the construction railway had 250 such cars at its peak. 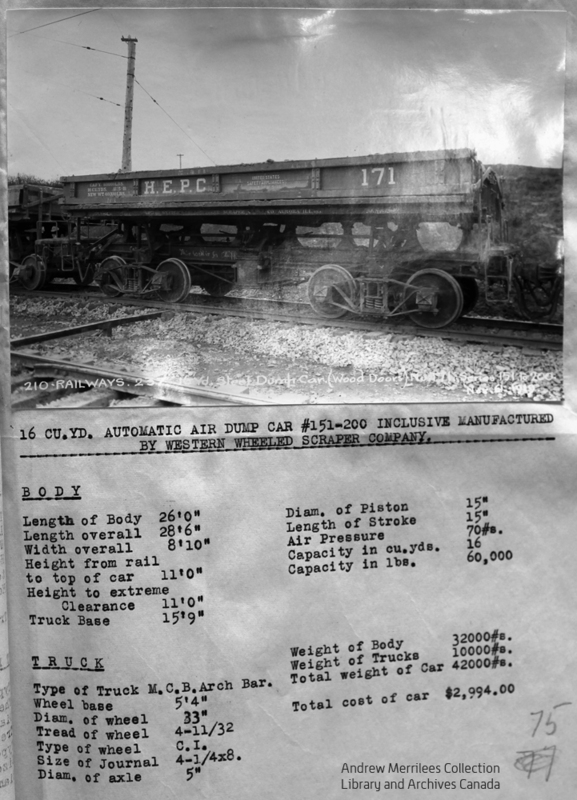 The locomotives were equipped with extra air tanks and high-capacity compressors to provide the air necessary not only for braking but also to operate the dump cars. 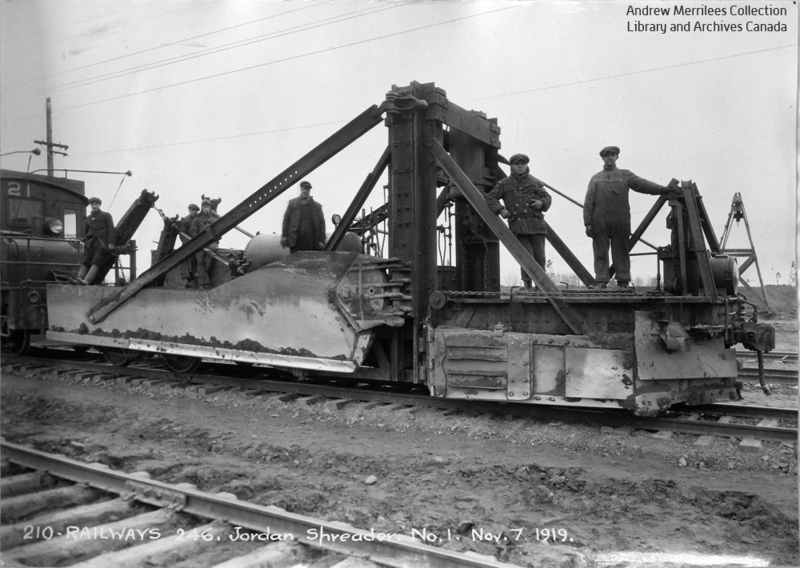 HEPC Jordan Spreader 1 – November 7, 1919. Photographer unknown. 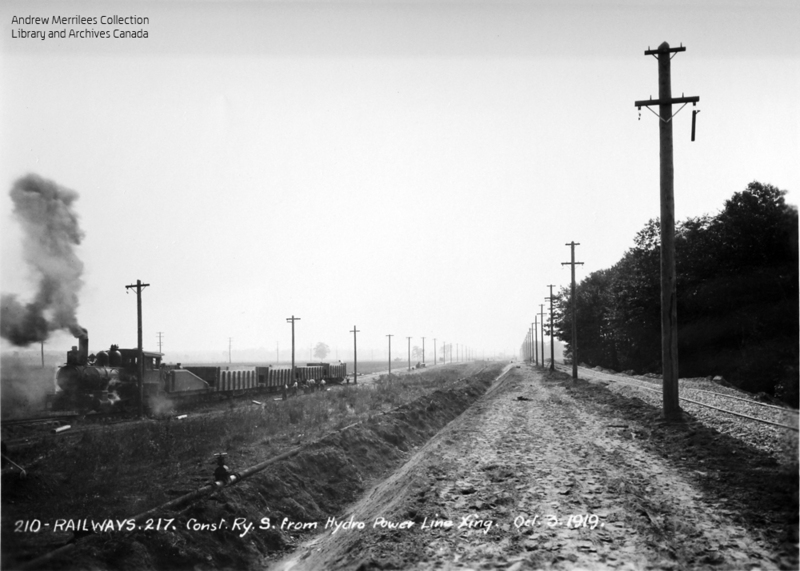 As noted in yesterday’s post, this railway was an interesting electric line that once operated in the Niagara Region – and which supplied a few freight motors to the Niagara St. Catharines and Toronto Railway. To the best of my knowledge, the Jordan Spreader that is the subject of this post did not end up on the NS&T (although the freight motor behind it – HEPC 21 – did, as NS&T 18). But since I found a number of interesting photographs of the operation in the archives, I’ve decided I’ll add them to my website. 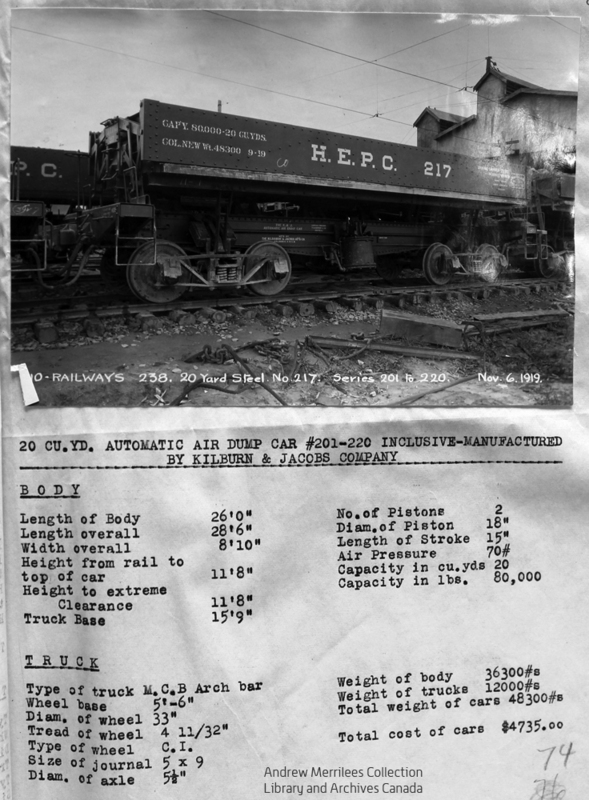 I’ve also created the “HEPC – Construction Railway” category to capture all of the posts related to this line. You can also find this in the “Categories” menu in the right hand column on the home page. 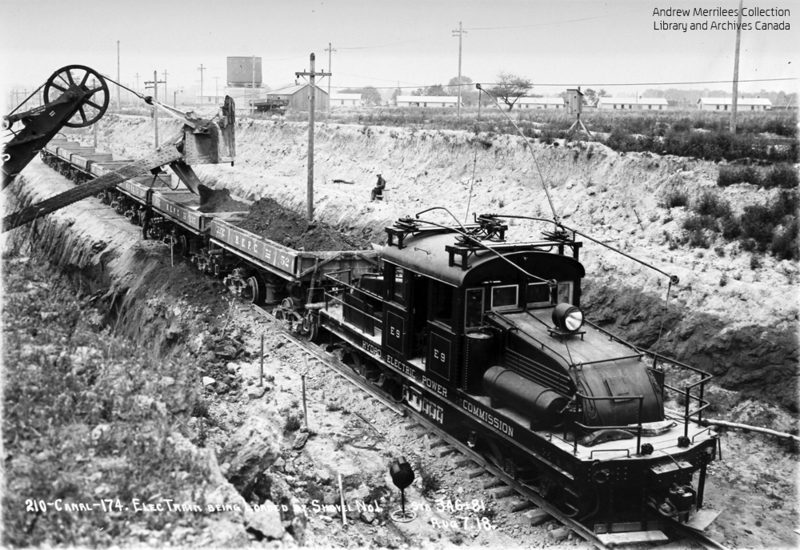 A HEPC freight motor and Jordan Spreader work on the Queenston Power Canal Construction Railway. Photographer and date unknown. The Niagara St. Catharines & Toronto Railway acquired its freight motors from a variety of sources. 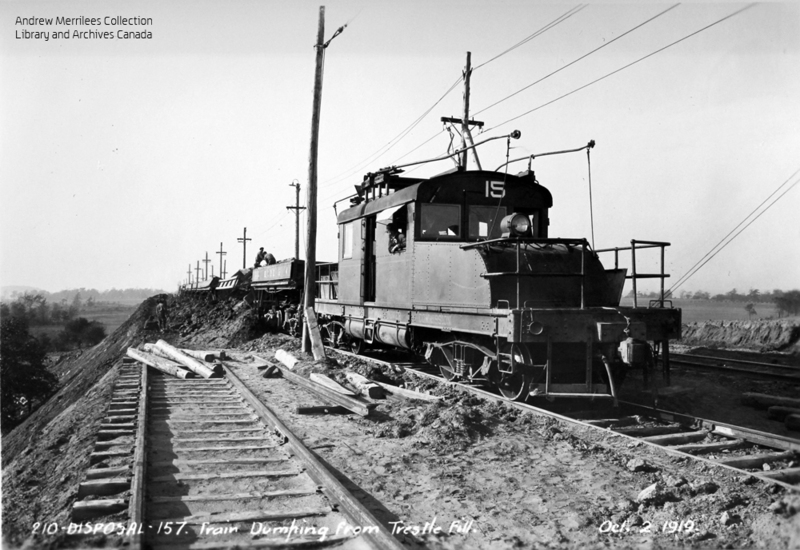 Three locomotives – NS&T 16, 17 and 18 – arrived on the property via the Queenston Power Canal Construction Railway. 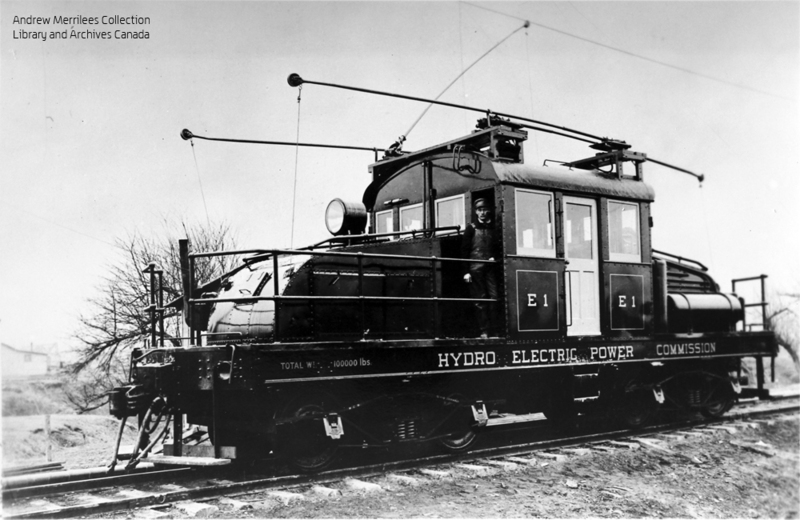 This railway – built by the Hydro-Electric Power Commission (HEPC) of Ontario – operated for three years (1918-1921) with the sole purpose of helping to excavate a power canal designed to drive the hydro-electric generating station at Queenston, Ontario. Chapter 18 of the revised John Mills book on the NS&T provides a good capsule history of the railway, so I won’t repeat it here. 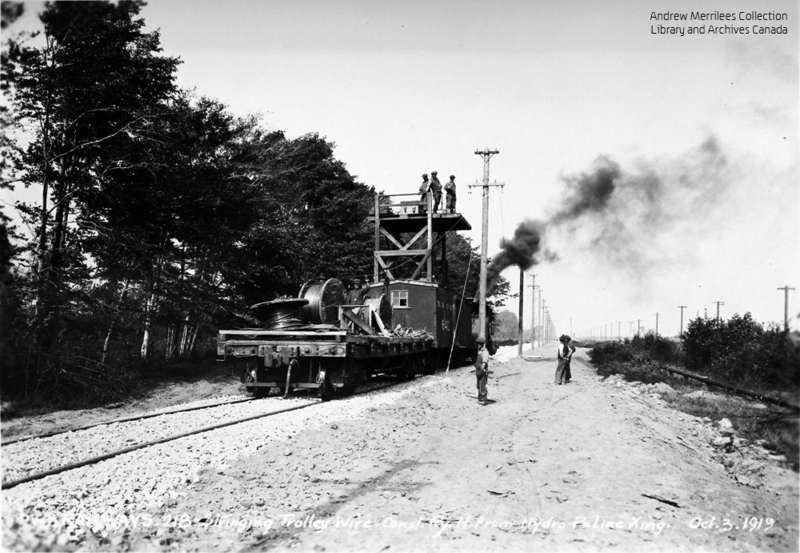 While working my way through photographs of the Niagara St. Catharines & Toronto Railway from the Andrew Merrilees Collection at Library and Archives Canada in September, I found a number of images from the construction railway. HEPC E1. Photographer and date unknown. HEPC E3. Photographer and date unknown. HEPC E9. Photographer and date unknown. The construction railway rostered 12 of these handsome steeple cab electrics – built in 1918 by National Steel Car Company of Hamiton, Ontario. These 50-ton models were 35 feet long. 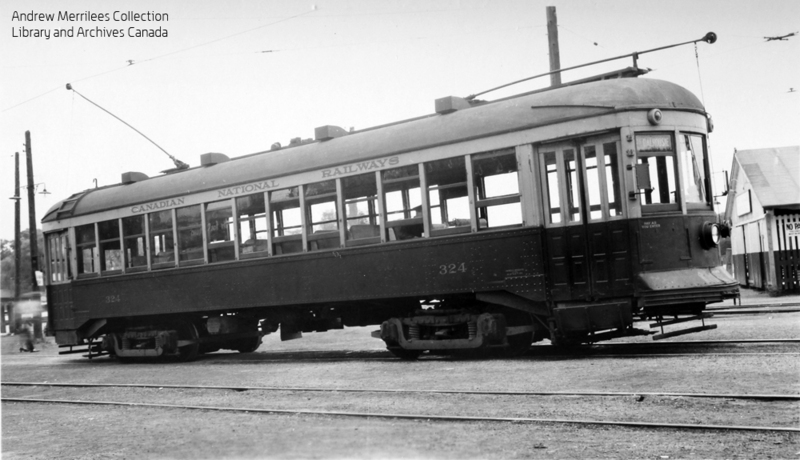 Note the four trolley poles on each motor: this was required because the overhead wire was mounted off-centre to keep it out of the way of shovels while loading dump cars. The photograph of E9 clearly shows this. Note also that these freight motors are fitted with large air tanks – again, this is clearly seen in the photograph of E9. 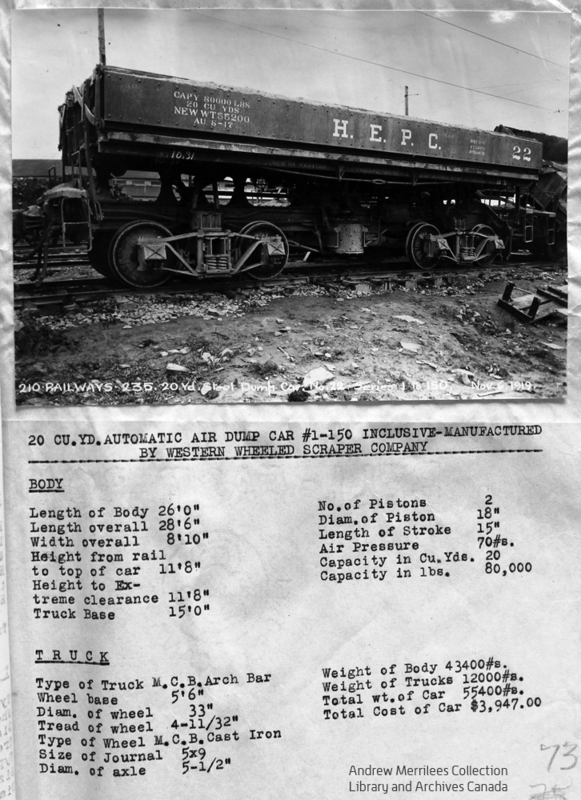 These freight motors often handled cuts of eight-to-10 air-operated dump cars, and needed extra air capacity not only to provide sufficient braking but also to be able to power the dump mechanisms. NS&T 17 – Welland Car Barn, St. Catharines. Photographer and date unknown. HEPC E17. Photographer and date unknown. This engine was part of a 1919 order (E13 to E18) from Canadian Car & Foundry in Montreal. 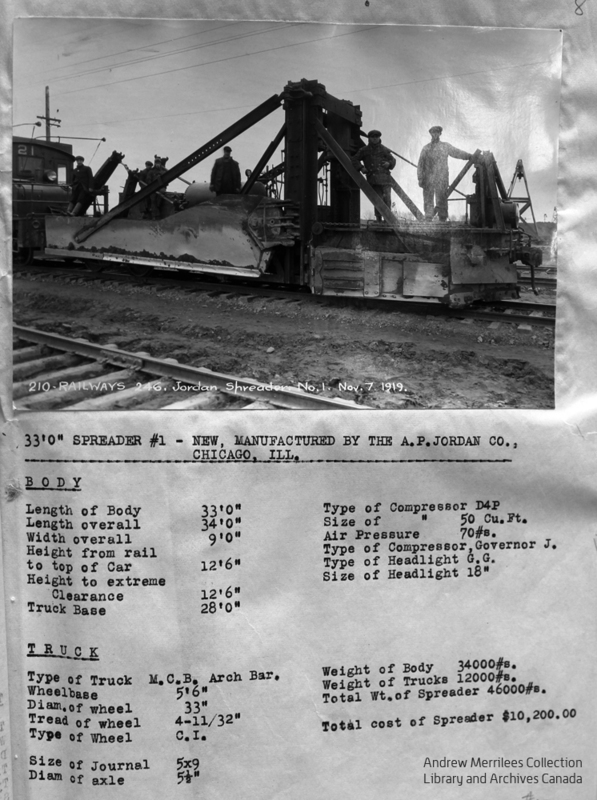 These were also 50-ton freight motors, but were 41 feet long over all. HEPC E15. Photographer and date unknown. E15 and E17 were amongst the freight motors that the HEPC sold to the International Nickel Company in Sudbury in 1926. HEPC E21. Photographer and date unknown. 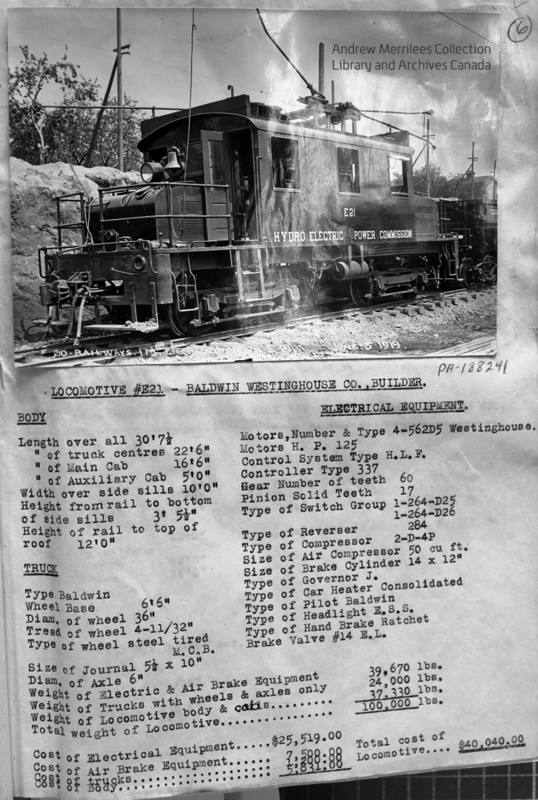 The HEPC acquired this Baldwin-Westinghouse 55-ton freight motor second-hand in 1919 from the Auburn & Syracuse Railway in New York State. It went to the Toronto & York Railway as its #2 in 1924 before ended up back in the Niagara Region in 1927, as the NS&T 18. 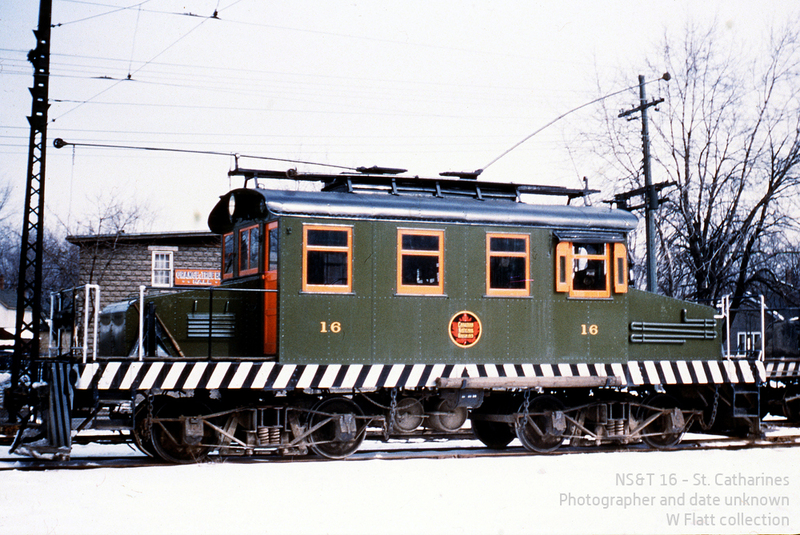 When the wire came down in 1960, the CNR forwarded this freight motor to the Oshawa Railway as its #18. 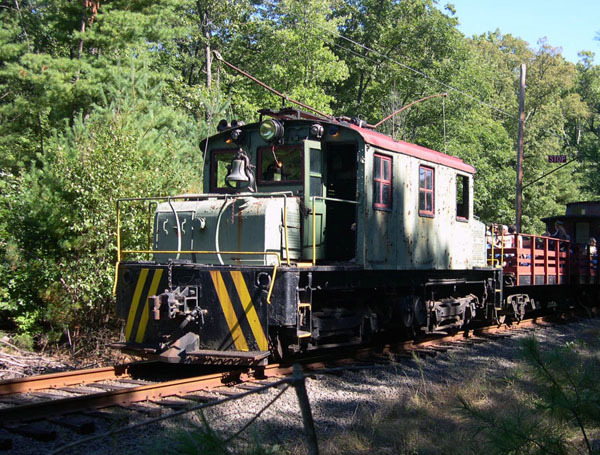 This freight motor was fortunate enough to go into preservation, when it was sold to an enthusiast and ended up at the Connecticut Trolley Museum in 1964. 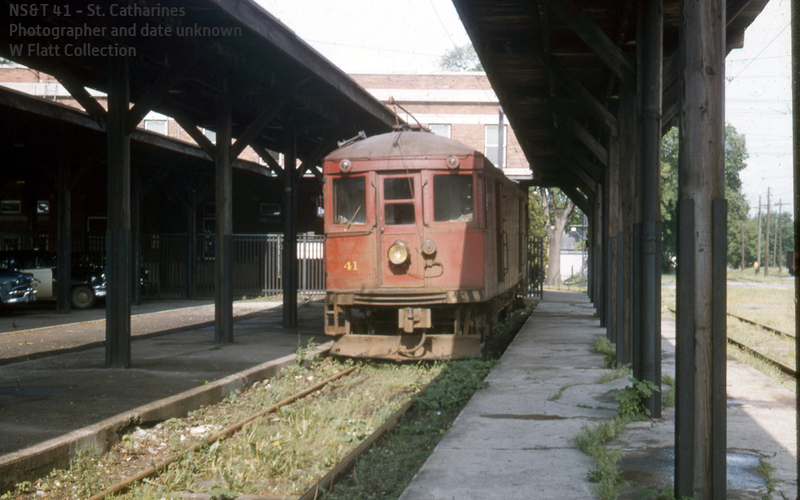 NS&T 16 – Welland Avenue car barns, St. Catharines. Photographer and date unknown. Number 16 ended up in Oshawa in 1960 – then went to Noranda Mines Ltd. in 1965. 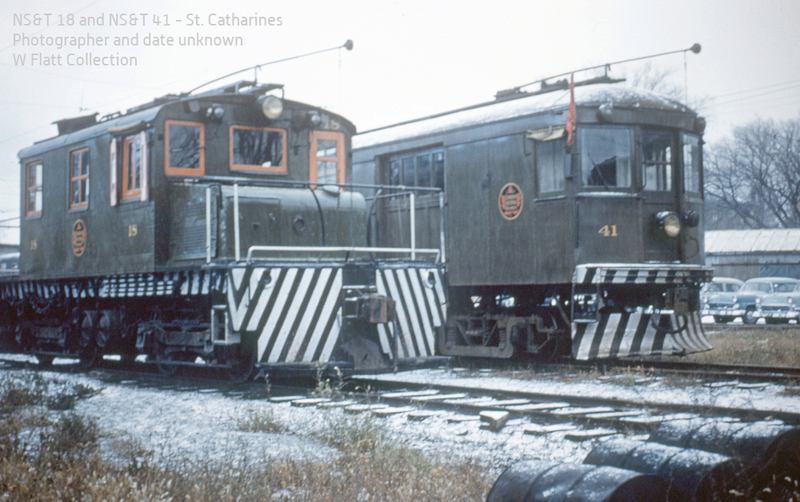 NS&T 41 – St. Catharines. Photographer and date unknown. There are some neat details in this picture, including an electric light under the canopy – just to the right of the freight motor. That’s good to know for anybody interested in modelling this handsome yet little-used passenger terminal. As always, you can check the categories menu on the home page for more posts about specific subjects – including Express Motor 41, the Geneva Street Terminal and The Andrew Merrilees Collection. NS&T 326 – Port Dalhousie. Photographer and date unknown. NS&T 324 – Port Dalhousie. Photographer and date unknown. These two photos are looking east in the ferry dock yard at Port Dalhousie – and while they’re fairly standard views of NS&T equipment, I like that they show some details of the terminal building on the right side of the photos. This was on the water’s edge and was where people would shelter while waiting to board the NS&T lake boats headed for Toronto. Here’s another view of 324 in the ferry dock yard, this time looking west. The photographer may have been standing in front of the terminal building shown in the earlier photos. This photo is from a different era than the previous picture of 324 – note the bars over the lower windows on the car in this picture (and the kid demonstrating how they don’t quite keep arms in). The building behind the 324 (at left) was one of many framing this yard area. I have better photo of that building, which I’ll share in a future post. The two cars shown in these views were part of the 320 series (320-326). 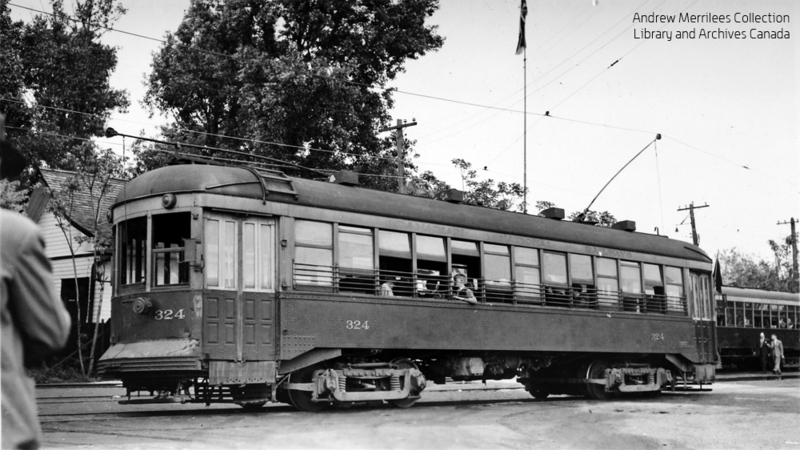 These 52-seat suburban cars were built by Brill in 1917 for the Washington-Virginia Railway. The NS&T acquired them in 1929. They were 48’4″ long, weighed 56,200 lbs, and rode on 6′ trucks spaced 21’6″ apart. 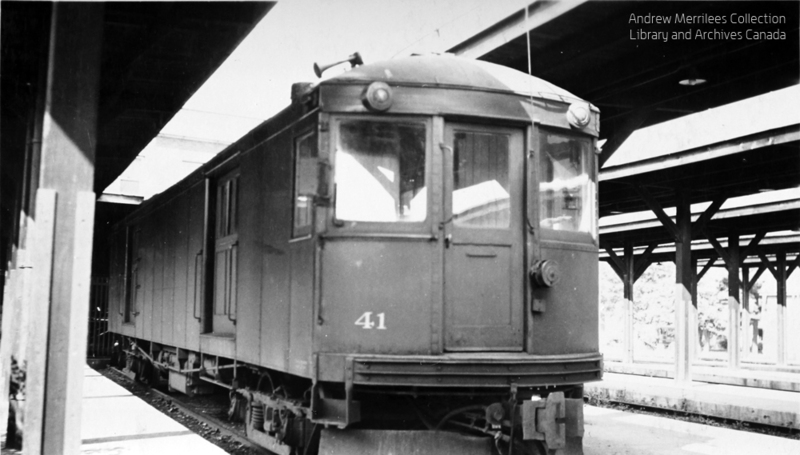 Car 323 was scrapped in 1945, while the rest were transferred to the Montreal & Southern Counties (another CNER property) in 1947, and scrapped in 1956. NS&T 320-326 were known as the “Washington” cars, and in his revised book on the NS&T, author John Mills describes them as the most versatile cars the railway ever owned – noting they could handle local or suburban services, and were even used in mainline extras when required. They were favourites for the Port Dalhousie route. Drawing on a finding aid compiled by Ottawa-area railway historian Colin Churcher, I tracked down and copied numerous photos of the Niagara St. Catharines and Toronto Railway and its predecessor lines. As part of the Merrilees collection at LAC, these are free to distribute with proper attribution, so I’ll be sharing my findings on this blog as time permits. To that end, I’ve created the Andrew Merrilees Collection category, so readers may find all posts related to this incredible archive of railway history.